TOPAS, the company behind Wheaty, is a family business still run by its founder Klaus Gaiser. What started as a tiny operation in the family home today is one of the most successful vegan and organic brands in Europe. When the eventual founder of TOPAS, Klaus Gaiser, returned from two study trips abroad in the mid-seventies, he brought with him what would turn out to be knowledge essential to his future career. During his stays in Japan, China and Indonesia, he immersed himself in the culture of East Asia. A particular focus of his was food manufacturing. In Japan, he had the opportunity to get deep insights in the traditional cuisine: he got to spent time in a Sake brewery, a kitchen in a Zen temple, and other places. In Kamakura, he had the chance to learn from an old Tofu master. A student of sinology (Chinese and China studies), japanology and cultural studies, Gaiser returned to Germany in 1978. He now had not only his lifelong fascination with Asian culture and cuisine, but was now also equipped with the technical skills to make the continent’s food. He started manufacturing Tofu, at first on a small scale for private consumption and for his Asian friends. Only a few months after his return from Asia, he held his first hand-made block of Tofu in his hand. 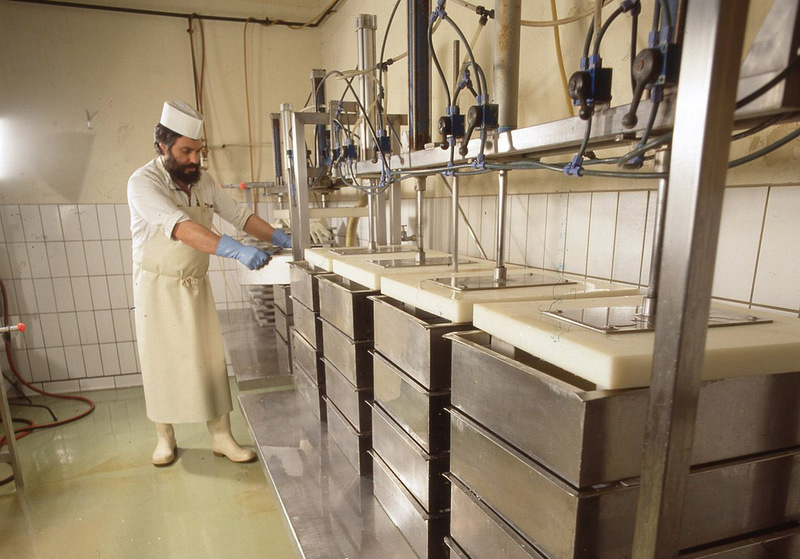 Before long, demand grew, and Gaiser was increasingly able to sell Tofu products to a wider range of interested customers in organic food shops. In 1980, he started production of soy-based specialties in earnest. The small enterprise was one of the very first manufacturers of Tofu in Germany, starting out in the ‘Milchhäusle’ (Lit. “Small milk house”), a former dairy in the Swabian small town of Mössingen. Soy beans were supplied by an organic farmer in nearby Tübingen. In 1984, “Yamato Tofuhaus GmbH” officially entered the company register. What followed were busy and turbulent years which, despite all difficulties, brought steady growth. Tofu began to be better known in Germany, and demand increased steadily. In 1987, the company moved into a larger building in Tübingen. From 1989 on, a company in the health food market took a share in Yamato, planning a large Tofu manufactory. In 1992, Gaiser left the Joint Venture. As a result of a radically new approach, Gaiser founded Topas, the company behind Wheaty, in 1993. Its products were to be based on the other pillar of vegetarian Asian cuisine: the wheat-protein based Seitan. Initially, pasta were on the menu, too – TOPAS is short for Tofu-Pasta-Seitan. Gaiser was fascinated by traditional japanese noodles. They, completely unknown at the time in Europe, featured alongside vegetarian ‘Swabian pockets’, a type of pasta traditionally filled with meat. Before long, however, Seitan-based products became more and more important to the company. Its philosophy now headed in a completely new direction: where the ideal at Yamato had been to convince Europeans of the excellence of Asian cuisine, the new creations mimicked the look and taste of well-known domestic meat products. At the time, this change of direction was not an obvious choice: while Tofu had steadily gained popularity and acceptance in Germany throughout the eighties – not least thanks to Yamato Tofuhaus -, hardly anyone had heard about Seitan in the nineties. The new company’s first delivery, in 1994, was a measly four small boxes; business was initially conducted around the living room table at the family home. But this wouldn’t last for long. Topas’s Wheaty range would grow more and more successful with every year. One of the young company’s iconic first products was the “Spacebar.” Created in 1996 to resemble a traditional German sausage, the Landjäger, it “took off like a rocket,” Gaiser says today. The product hit a nerve: the vegan scene in the nineties lacked a hearty, protein-rich snack that could be taken anywhere. Today, with a PETA award under its belt, the Spacebar range is still an essential part of the company’s product range, with four delicious varieties. In 2000, the company had grown so much that it had to move to dedicated facilities in Mössingen. The new hall measured some 300 square meters (about 3,200 sq ft), and there was great concern whether it wouldn’t be too large, something that Klaus Gaiser and his wife, Sanni Ikola-Gaiser, have to smile about today – because before long, the landlord was approached about renting another floor in the same building, and then another. The staff grew as well – from initially just the Gaiser family (with local students, helping out labelling products – a popular summer job even today) to five employees in 2000, and more than two hundred today. The Wheaty range, comprising about 50 products, is sold in sixteen countries now. The company moved into even larger premises a couple of years ago; Klaus Gaiser remains in charge of developing new products, in a converted butchery down the road from the Milchhäusle where everything began more than 30 years ago. Once a niche phenomenon for a small circle of enthusiasts, our products – along with vegan alternatives in general – have long reached the mainstream, featuring in major newspapers, magazines, and other media. Only a decade ago, it would haven been unthinkable that a publication like Men’s Health should write as favourably about our products as it did in 2012, presenting us as a serious alternative to the butcher’s when looking for something to put on the grill. Despite our massive growth, we haven’t forgotten our pioneer roots. We take great strides to manufacture our products ethically and sustainably. We have always been certified organic; we avoid ingredients that are sourced from rainforest areas, or are otherwise ethically dubitable. We purchase our raw materials from central Europe where possible. We have always avoided palm oil – long before it became a news item – because we believe that even its organic variety is ecologically questionable. We’re looking forward to many more years of being the market’s most innovative company, surprising you with vegan delights old and new!